The following is a practical DIY tutorial showing how to convert an AC Fluorescent Strip Light to DC Fluorescent Lighting by replacing the existing ballast unit with an OnSolar DC version. Please read through and study the images carefully. If you think there are errors or maybe you just have questions, please drop us a line. There are actually 3 ‘sizes’ of DC ballast available to convert 18/20w (60cm), 30W (90cm) and 36/40w (1.2m) single fluorescent tube systems. Also two voltage options as 12v and 24v DC (nominal). We will look at just one option here right now, converting an elderly AC 240V 20W 60cm unit. The unit itself looks a bit of an old crock but we are strong believers in recycling serviceable items – still perfectly okay for a remote workshop. With a quick rub down and a new coat of paint, it will look fab and last for many years to come. Firstly, we have to stress safety here. 110V or 240V AC power is dangerous so if you are taking such a fitting out of service to convert please be sure to isolate power and work safely. Please also note that having converted your old ‘AC’ lamp to DC Fluorescent Lighting it cannot be connected to an AC supply (without a suitable DC transformer unit). Okay, you will need just a few simple tools and parts such as small pliers, wire cutters, small electrical screw driver and perhaps a larger screwdriver to install / fit the lamp later. Parts required will include reasonable quality 2 core cabling and connector blocks. Crucially you will require a nice quality DC rated ballast unit of 18/20W, 28/30W or 36/40W in a 12v or 24v option as the case may be for your particular lamp and project. 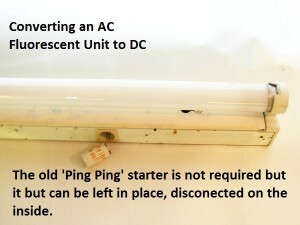 For an older style fluorescent fitting, it is worth noting that the ‘Ping Ping’ ‘starter’ unit will be redundant. You can of course leave this in place so that the lamp is not left with a large hole in its side. It is simply a case of snipping through the two wires that connect to the starter unit. 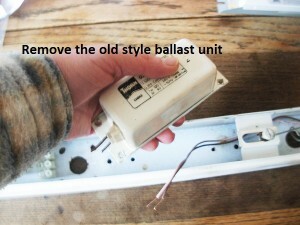 Cut the wires to / from the old ballast and carefully remove it. Prepare the wires from the tube connectors ready to insert into a connector block (both sides). Take your new DC ballast unit, insert into position in the lamp body and fix in place. With luck, it will fit into virtually the same position as the old unit and may not require the addition of further fixing points. If necessary mark out any new holes that may need to be drilled in the old lamp body. 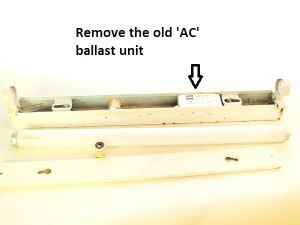 Fit the ballast unit with either small self-tapping screws or small nuts and bolts as the case may be. Do not leave unfixed or be tempted to use double sided sticky tape to fit. Connecting the new DC ballast unit to the tube. Prepare lengths of suitable cable ready with bared ends. Insert one set into the connecting block on one side of the tube and then connect into the ballast unit where indicated, repeat for the other end of the tube. Finally, you will need to prepare a suitable length of cable to allow connection to your DC power source. We recommend using a good quality multi strand cable. As with any other extra low voltage installation, one must consider voltage drop. If you intend the distance from battery to lamp to be considerable, you will need to be aware that voltage may fall below the recommended nominal 12v operating voltage. For installs with cabling of 2 or three meters .75mm will be just fine. For longer distances, we would recommend 1.5mm and perhaps 2.5mm for distances over 15 meters. To finish the project so that it is safe and nice and tidy, you can fit a cable gland if the lamp was not equipped with one (assuming you cable will exit from one end). This may require a hole being drilled into one of the lamp ends so care must be taken to consider the positioning so that the required back nut will fit on the inside. Of course, if you intend to fit the lamp into a ceiling mounted position, the supplied cable entry point on the underside should be fine but be aware of any sharp metal edges pressing against cabling. The above is intended as a practical guide for a keen DIY’er to assist. If you are not confident with electrical installations, please ask a qualified electrician to advise or assist you. Now we think these conversions hands down beat the available ‘junk grade’ DC fluorescent units that are available typically for installation into sheds and such. Besides, there are some very nice fluorescent lamp units both 2 foot, 3 foot and 4 foot (sorry, still stuck in imperial – metric: 60, 90 and 120cm) available that could be converted (far better looking than the old timer we have used here to illustrate the article). So, one could use such for a large workshop, boat or off grid home just like the regular AC equivalents – now that’s cool! That’s how simple it is! Connect your DC supply 12v or 24v as the case may be to the input side of the ballast unit taking care to ensure correct polarity as red or brown for positive(+) and blue or black for negative (-). 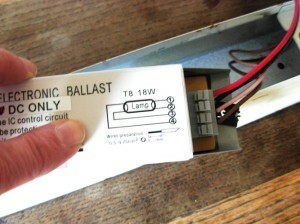 The output connections from the ballast unit go to each end of the tube connectors and are not polarity dependant (just be sure to take one output to each end of the lamp). As always, we recommend using a suitably rated fuse and properly rated, good quality cabling with your DC lighting install – be safe! We hope you found our article on DIY Fluorescent Lighting conversion – AC to DC interesting. See more DC related products and articles at the OnSolar Blog now!